Wyoming is a key uranium-producing region in the United States, and a fair number of companies are doing exciting work there. In the past, Uranium Investing News has discussed a wide variety of uranium hot spots, from Saskatchewan’s Athabasca Basin to Mauritania to Australia. Now it’s time to take a look at Wyoming, a center of uranium-mining activity in the United States. Here’s a brief overview of some of the most important companies operating in that region. Cameco is not only a major presence in Wyoming, but also one of the world’s largest uranium producers, accounting for about 15 percent of the globe’s production. In Wyoming, Cameco Resources, a subsidiary of Cameco, operates Smith Ranch and Highland as a combined operation. Specifically, “[e]ach has its own processing facility, but the Smith Ranch central plant currently processes all the uranium and the Highland mill is currently idle,” as per Cameco’s website. Smith Ranch has proven and probable reserves of 5.2 million pounds of U3O8 at an average grade of 0.09 percent. Like Cameco, privately owned Uranium One is one of the largest uranium producers in the world. In Wyoming, it owns the Willow Creek mine, along with a number of development projects in the Powder River and Great Divide basins. Total proven and provable reserves at Willow Creek amount to 7.18 million pounds of U3O8. Junior explorer Cyclone Uranium is focused on uranium prospects in Wyoming, where it owns 965 federal mining claims. Its Cyclone uranium project is located in the state’s Great Divide Basin and encompasses two main areas: the West Divide uranium trend and the New Fork uranium trend. The Cyclone project has a number of positive qualities, including the fact that it is close to electrical power and natural gas lines; further, there are no residents within the project area. It is also highly prospective due to its proximity to a number of important projects, including the past-producing Sweetwater uranium project, which is managed by Rio Tinto (ASX:RIO,LSE:RIO,NYSE:RIO). Energy Fuels is a company with a lot going on. In addition to producing both uranium and vanadium, it has the only operating uranium mill in the US. At the moment, it has two operating mines, but it has many more in development — that’s where Wyoming comes in. 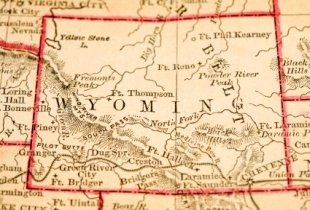 The company has a number of development projects in Wyoming, one of which is Sheep Mountain, a large uranium mine in Wyoming’s Fremont County. It used to be operated by Western Nuclear, but production ceased there in the 1980s; Energy Fuels acquired the site in 2012, when it bought Titan Uranium. The company’s permit is currently active, and it plans to redevelop the project using both open-pit and underground mining techniques. Sheep Mountain holds about 12.9 million tons of measured and indicated resources at an average grade of 0.12-percent U3O8. Uranerz Energy specializes in in-situ recovery uranium mining operations and just recently began production at its first uranium mine, Nichols Ranch. It was able to do so as soon as it received clearance from the US Regulatory Commission. The company has a processing agreement with Cameco as well as long-term uranium sales contracts with nuclear utility companies like Exelon (NYSE:EXC). Since August 2013, Ur-Energy has operated the Lost Creek uranium mine in South-Central Wyoming, making its first sale of yellowcake from the site in December of that year. During the first quarter of 2014, Lost Creek produced 198,573 pounds of U3O8, about half of which was sold to utility customers under long-term purchase contracts. The company expects to produce approximately 1 million pounds of uranium in 2014. Peninsula Energy is an Australian company with uranium assets in both Wyoming and South Africa. In Wyoming, Peninsula holds the Lance in-situ recovery uranium project at the northeast end of the Powder River Basin. Over the course of the last five years, the company has successfully delineated a JORC-compliant resource of over 53.7 million pounds of U3O8 — that’s one of the largest mineral resources in the United States. Most recently, Peninsula was granted a Combined Source and Byproduct Materials License by the US Nuclear Regulatory Commission. That license sets the stage for the company to start production in the final quarter of 2014. Headquartered in Vancouver, Canada, Bayswater Uranium is an exploration and development company that works in Canada and the United States. It owns 11.09 percent of the Reno Creek project in the Powder River Basin.